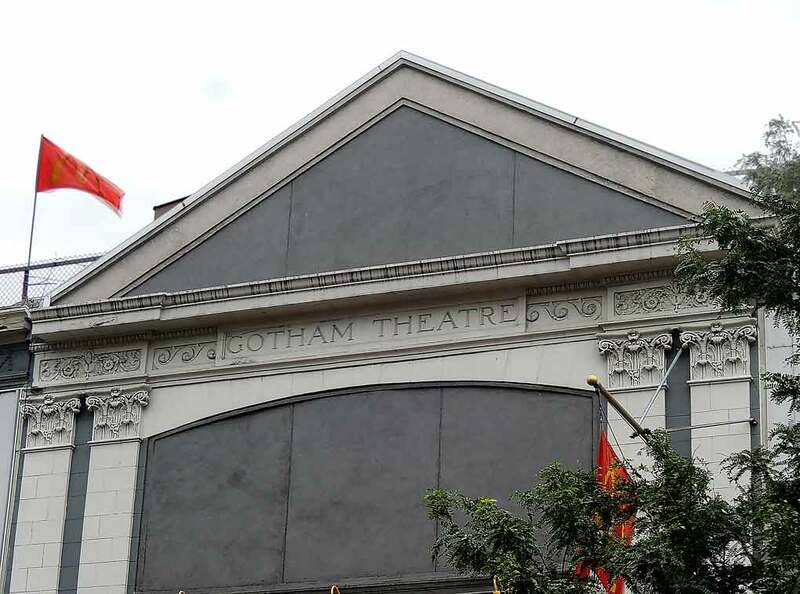 The Gotham Theatre was constructed in 1920, a 3-story brick stores and theatre measuring 99 by 223 feet. The owner was Michael Friedsam, 361 Fifth Ave. The architect was Carlson & Wisemen, 226 Henry St., Brooklyn. (Office for Metropolitan History, "Manhattan NB Database 1900-1986," (18 January 2015), http://www.MetroHistory.com ). The theatre ran continuously as a movie theatre from 1920 to 1961, first as the Gotham Theatre (1920-1936) and then as the Delmar Theatre (1937-1961). It was managed by Harris Theatrical Enterprises, described as follows in Yearbook of Motion Pictures - 1935, "Harris Theatrical Enterprises, N. Y. / Home office: 3410 Broadway, N.Y.C. No. of Theaters: 7 / Gen'l Mgr. : Harry A. Harris. / Film Buyer: Harry A. Harris. / New York, New York: Blue Bird, Central, Columbia, Gotham, Sunset, Washington, Bronx." Harris Theatrical Enterprises was the business of Harry A. Harris (1892-1987), son of Louis I. Harris, also a theatre owner. Harry Harris registered for the World War I draft in 1917, when he said that he was born in New York City 4 Nov. 1892. In the 1920 U. S. Census father and son. Louis Harris and Harry A. Harris, were recorded living at 332 W. 141st St., Manhattan. Louis Harris, an immigrant from Russia, was 49 years old and Harry Harris, 27. Neither was identified as involved in theatres. In the 1925 New York State census, however, both gave their occupations as "Motion Pictures." In the 1930 U. S. Census, when they lived at 3495 Broadway, both were called "Proprietor, Motion Pictures." In 1940 Louis I. Harris and Harry A. Harris still lived together in 3495 Broadway. Louis Harris was "Proprietor Theatre," and Harry Harris was "Proprietor Motion Picture Theatre." In 1942 Harry A. Harris, age 49, registered for the World War II draft when he lived at 3495 Broadway and said that he was self-employed at 3410 Broadway, New York, N. Y. In 1953 on his death Louis I. Harris received the following obituary in the New York Times, 14 Jan. 1953, p. 31, "Louis I. Harris, former resort operator in Staten Island, died yesterday in the Hospital for Joint Diseases after a long illness. Mr. Harris, who was 82 years old, resided at 3495 Broadway. He was born in Poland. In the last century Mr. Harris became a photographer on the Bowery and in 1888 he opened a photography business at South Beach, S. I. From 1910 to 1935 he operated the Harris Hotel and Bathing Pavilion there and formerly had been a partner in the Happyland Amusement Park in South Beach. He owned and operated several motion picture theatres in Manhattan and the Bronx before he retired. A widower, he leaves a daughter, Mrs. Beatrice Apfelbaum of Manhattan; a son, Harry A. of Manhattan; three sisters, Mrs. Rachel Niselkovsky of Montevideo, Uruguay, Mrs. Hilda Cohen and Mrs. Pearl Fox, both of Staten Island; a brother, Abraham of Staten Island; three grandchildren and three great-grandchildren." After the Gotham name changed to the Delmar the following appeared in Yearbook of Motion Pictures - 1958, "Harris Theatres (Agent) 3410 Broadway, New York, N. Y. ALdubon [sic] 1-1300 / General Manager Harry A. Harris / Film Buyer Lillian Seidman / Theatres (10): New York, New York: Boricua, Azteca, Colon, Delmar, Dorset, Sunset; Bronx: Sun, Isla; Brooklyn: Altantic [sic], Amor." Other than the Gotham, of the Harris Theatrical Enterprises theatres of 1935 the Central at 771 9th Ave. and the Washington at 1805 Amsterdam Ave. still exist. The Central is now (2015) a paint store, and the Washington the New Covenant Temple church. More on these can be found at Cinema Treasures: (Central) and (Washington).